1. Place coconut flakes and almond flakes onto a paper lined baking tray and bake at 180C for 5-10 minutes and until golden brown. Keep an eye on them to ensure they don't burn. 2. 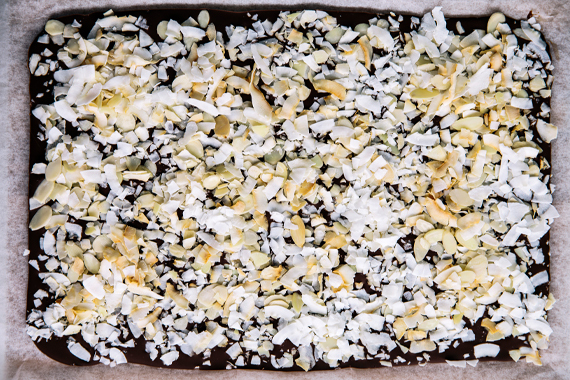 Remove the coconut and almonds from the oven and set aside to cool. 3. Melt the milk and dark chocolate on low heat. 5. Top with the toasted coconut and almonds. 6. Place into the fridge to set overnight. 7. Remove from the fridge and cut into bite sized pieces. 1. Melt the white chocolate on low heat. 2. Pour the melted chocolate into a paper lined tray (roughly 20cm x 30cm in size). 3. 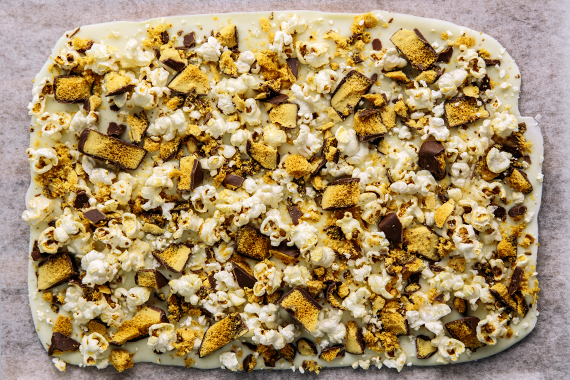 Top with the popcorn and chopped honeycomb. 4. Place into the fridge to set overnight. 5. Remove from the fridge and cut into bite sized pieces. 1. Melt the milk chocolate on low heat. 3. Top with the Oreos, pretzels, marshmallows, raspberry lollies, mint crunch bar, turkish delight, M&M’s and sprinkles. 5. Remove from the fridge and cut into bite sized pieces. Enjoy!